Seven years ago, Writer Abroad was lamenting the lack of a writing community in Zurich. In 2010, she decided to stop complaining and start creating. But how do you create a writing workshop? Writer Abroad had no idea. But along with two other Zurich-based writers, she decided to figure it out. Together, the three of them formed the Zurich Writers Workshop. Since then they’ve organized three writing conferences in Zurich featuring authors like Susan Jane Gilman, Diccon Bewes, and Janet Skeslien Charles. The result? Writers from over five countries have come to Zurich to be inspired. Many have come again and again. This also inspires Writer Abroad, because contrary to popular belief, writers don’t like to be alone–at least all the time. That’s why Writer Abroad would like to invite all authors, writers, and those who are scared to call themselves either to join her group for their fourth annual literary weekend in Zurich. It will take place from April 12-14, 2013. Writer Abroad thinks that no matter what your story is, the Zurich Writers Workshop–along with its two authors in residence–is sure to provide inspiration. And if you’ve been looking for an excuse to visit Switzerland or Zurich, here it is. Back by popular demand, Sam North will lead a course called Storytelling Fundamentals, perfect for those who are just getting started in writing. And Lee Weatherly will teach a course called First Draft to Bestseller, perfect for writers who have already completed a draft of a novel, memoir, collection of short stories or essays. Both authors will provide critiques, either written or in one-on-one sessions. But hurry. Only nine of the 27 places remain. Sounds fantastic, Chantal. I wish I could go! I've never been to Zurich. Perhaps some other year. 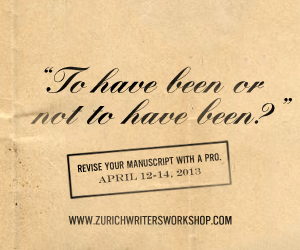 It's great to see a grass roots idea like the Zurich Writers Workshop establish a foothold. Sometimes when there's a need you have to take care of it yourself. Your group is living proof of that. Thanks for the updates from Europe. Thanks for your kind words. Hope to see you at a future workshop, John! I think I would probably also dream of Zurich if I left. Thanks for the link. Through bless you a great deal used just for showing. Piece of content was initially without a doubt interested in over it thought. At this moment pursue here payday loans lemon-grove Bye now that. Continue on site. Likewise, writers who guarantee not to realize how to get a word tally, do spell check, embedded page numbers, utilize left-adjusted edges (rather than supported), and a wide range of other extremely fundamental word handling capacities. I let them know - on the off chance that you will compose, at that point second just to your cerebrum, your statement handling programming is your primary device and you should figure out how it functions!